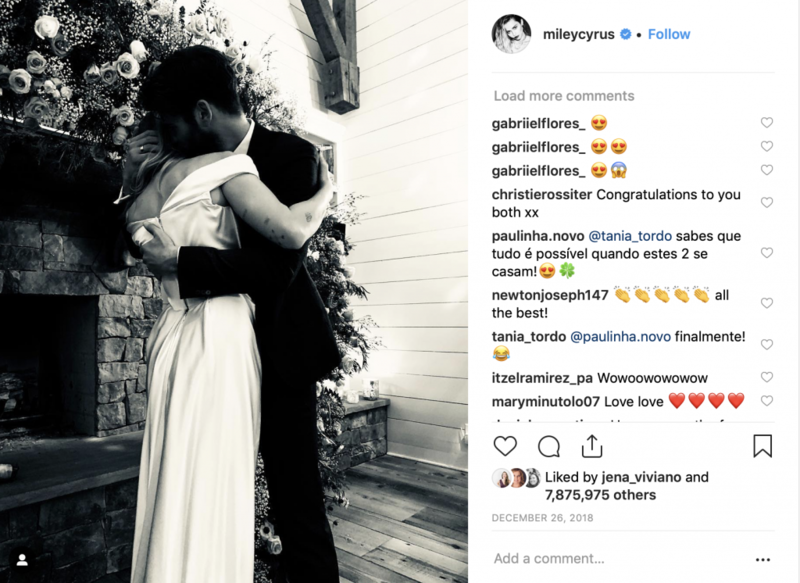 Miley Cyrus and Liam Hemsworth joined the growing list of low key, secret celebrity weddings over the holiday season. The couple’s wedding cost around 17k total, much less than the average 33k reported by The Knot in n 2017. We’ve covered similar secret wedding stories over the last year including Kim and Kanye, Tom and Gisele, and Mila and Ashton. Let’s look at the details and obviously our favorite part- the engagement ring and wedding bling! Hint- it’s all about the vintage vibes for Miley and Liam! Miley and Liam’s relationship dates back to 2009 where they met on the set of their film, The Last Song. It’s been an on again, off again relationship, but they finally decided to make it official last December. Miley grew up in the spotlight, transitioning from good girl Hannah Montana to wild child ‘Wrecking Ball’ singer in 2013, allegedly written after her breakup from Liam. Liam Hemsworth is an Australian actor that rose to fame for his role in The Hunger Games. The couple started dating in their late teens and were engaged three years later in 2012. Miley was only 19 and Liam 22 at the time. Babies by today’s standard! It’s no wonder they’ve had such a roller coaster engagement. Liam had a custom ring designed by celebrity jeweler Neil Lane, and we’ll get to all the gorgeous vintage details in a bit. Like the wedding, the engagement story was also super low-key. Miley discussed the deets of getting engaged during an interview with Jay Leno on late night tv. She performed a free online concert for her fans from her backyard, and Liam surprised her with dropping to one knee after she sang his favorite song, Lilac Wine. “I had no idea,” she told Leno. “He was sitting there and I’m like, ‘He’s looking at me funny!’ And then I knew.” Cyrus was completely surprised and had no idea Liam had been planning to propose. The decade after the surprise proposal included several breakups. Both Liam and Miley talked about the deep, real love they shared, and luckily the engagement was officially back on in 2016. Now, on to our favorite part- the Neil Lane custom designed engagement ring. Neil Lane is synonymous with red carpet engagement and wedding rings. His custom designed bling has been seen on celebrities for over 20 years, including Renée Zellweger and Angelina Jolie. Liam chose a vintage vibe to pair with Miley’s unique style. Lane used a 3.5 carat, cushion cut 19th-century diamond on a custom gold setting. He envisioned the Art Nouveau design with tiny little swirls and diamond details within a floral pattern, so that the vintage stone became the flower’s center. Jewelry experts guess the ring would retail around $100,000 dollars. Neil still claims it was one of his favorite designs ever. Miley and Liam choose to marry nearly 25 years after Miley’s parents Billy Ray and Tish were married. It was a secret, surprise wedding held on December 23rd at their Tennessee residence, having lost their Malibu home to the California fires earlier. The pair was married with just immediate family and close friends in attendance. Do you have plans to pop the question? Give Jonathan’s Fine Jewelers a call and experience the custom design difference.